The PRS Limited Edition SE Schizoid solidbody electric guitar celebrates the 50th Anniversary of the legendary King Crimson. 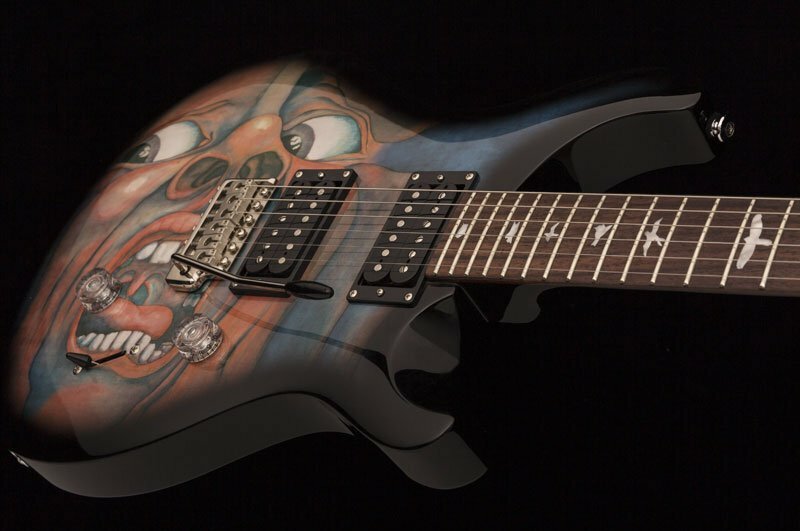 An SE Custom 24 emblazoned with the classic artwork from the band's epic In the Court of the Crimson King album, the Schizoid LTD is the SE production model of the album artwork-enhanced Custom 24 guitarist Jakko Jaksyk selected to play with King Crimson. Says Jakko: "Much as I loved and owned a number of vintage guitars, live I would always play something modern — more reliable. PRS is the best of both worlds. A modern instrument that feels and looks like a classic. So when PRS asked if they could make me something special it had to be a guitar with that iconic artwork. The ‘Schizoid Man’ face that started this whole journey off. Full circle as it were." Only 1000 of these very special guitars are being built. Get yours from Third Rock while you can! The Paul Reed Smith SE Schizoid puts the sound, playability, and gorgeous looks of the Custom line into a more affordable instrument. The tonewood recipe starts with a solid mahogany body and maple veneer top embellished with the iconic Schizoid Man graphics. Its mahogany neck features a wide-thin profile for easy playability, and the smooth rosewood fingerboard is adorned with classic PRS Bird inlays. Equipped with two great-sounding PRS-designed 85/15 S humbucking pickups, this guitar is a true PRS through and through, as well as being a great value. The two pickups in the SE Schizoid are Paul Reed Smith-designed 85/15 S humbuckers. An update on PRS's original humbuckers, the 85/15 S is designed to sound terrific whether used in humbucking or single-coil modes. They offer you plenty of output for driving your amp hard while sounding clear and detailed when you roll back your guitar's volume control. Pull up on the tone pot, and you'll access chiming, bell-like single-coil sounds. All Paul Reed Smith guitars are designed for performance, right out of the box — and the SE Custom 24 is no exception. Constructed from high-quality tonewoods and components, PRS instruments carry on a commitment to quality that's been the brand's hallmark since 1985, when Paul Smith began crafting guitars for some of the most elite players in the world. In fact, you'll often see a PRS SE in the touring rigs of the most well-respected PRS artists in the world.